Dodgeball is where its at! The Dodgeball Tournament at Fisher Middle School today was truly inspired! In a world where all the talk about “good schools” revolves primarily around, math, science, college preparation and API Scores, today’s dodgeball tournament offered something we don’t see that often anymore – something indescribably senseless and fun. Food was served while party music blared. Parents and siblings sat in bleachers cheering for their teams who wore T-shirts emblazoned with silly team names and costumes including feather boas, wigs and brightly colored, striped socks. 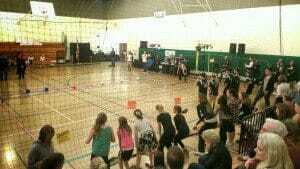 The dodgeball was great and it was plainly obvious that everybody was having a GREAT time. It brought memories of a time that seems to have vanished in a haze of 24 hour news channels, innovation, mobile devices, entrepreneurial spirit, overachievement, multiple 60′ TV screens, social media and upward mobility. Throw the ball and try to hit somebody on the other side of the line to get them out. In the meantime, try not to get hit by a ball that has been thrown at you. Or, better yet, catch the ball that was thrown at you to get the person who threw it out and bring one of your own team members back in. That’s it. Throw, dodge, catch and have a great time. Simple as can be. Untold months of planning involving dozens of staff, parent volunteers and some 1200 6th, 7th and 8th graders went into today’s dodgeball extravaganza and for what? The event offered not a single grade, test score, evaluation or result. Nothing about today will ever qualify as “extra curricular activity” or be included on any college application. This was a massive undertaking that took time and resources away from “learning” and I loved it. It made me realize on an even deeper level how much I appreciate what a “good school” Fisher Middle School is. Not only do our children get an incredible education but they are taught and lead by teachers and staff who care enough about them to spend a great deal of extra time and energy creating something that “doesn’t matter”. Yet this may be one of the most important gifts they can give to the young hearts and minds of students who have a lifetime of learning to look forward to. Learning is supposed to be fun and I would like to commend everyone at Fisher Middle School for taking that very seriously. 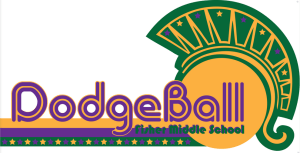 Click here to see the Fisher Middle School 2nd Annual Dodgeball 2014 Video Highlight Reel!